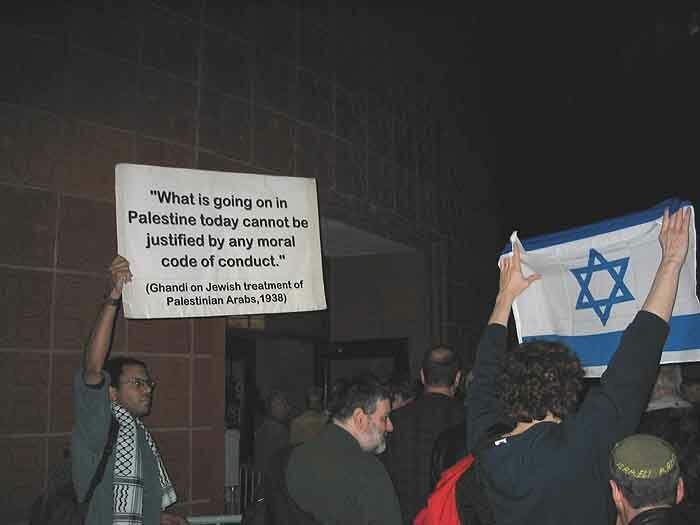 These photos were taken at the lecture that Daniel Pipes gave in Pimentel Hall on the U.C. 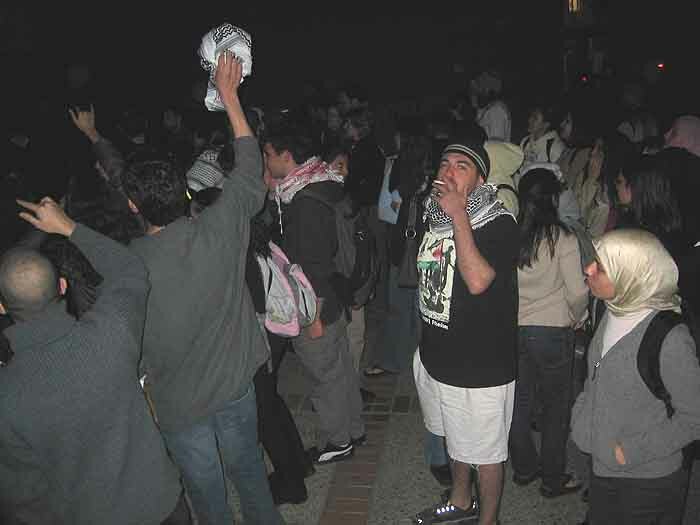 Berkeley campus on Tuesday, February 10th, 2004 -- as well as at the protest before and after the lecture. 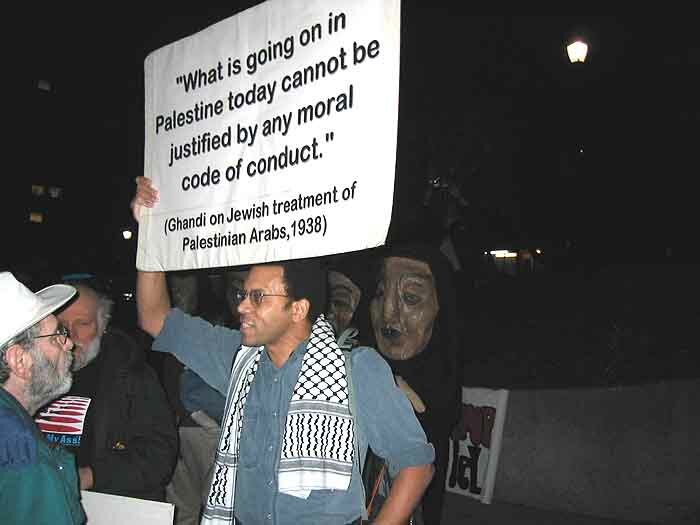 This is a transcript of the actual words spoken by the Palestinian supporter on the right to the Israel supporter on the left, as this picture was taken: "If you broke into someone's house and stole something, the owner would have the right to kill you. You'd deserve to die! 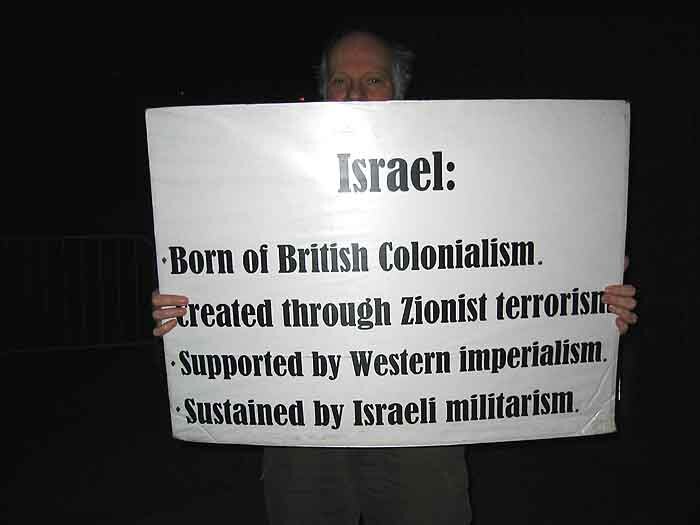 The Jews broke into Palestine and stole the Palestinians' land. So they deserve to die! 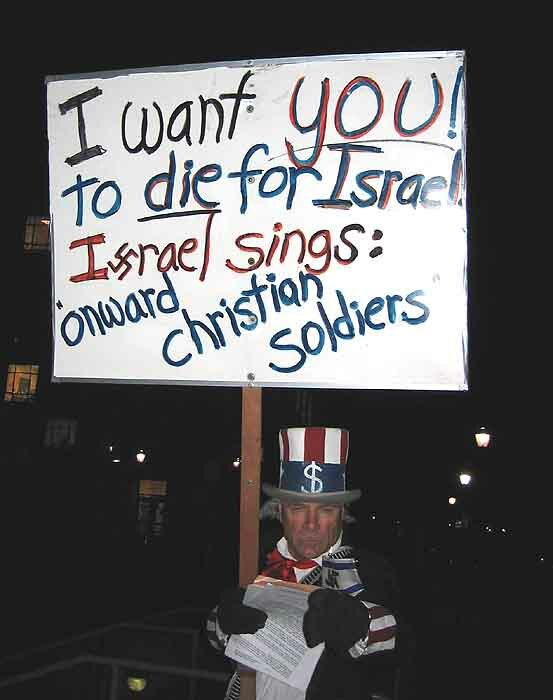 The Jews deserve to die!" 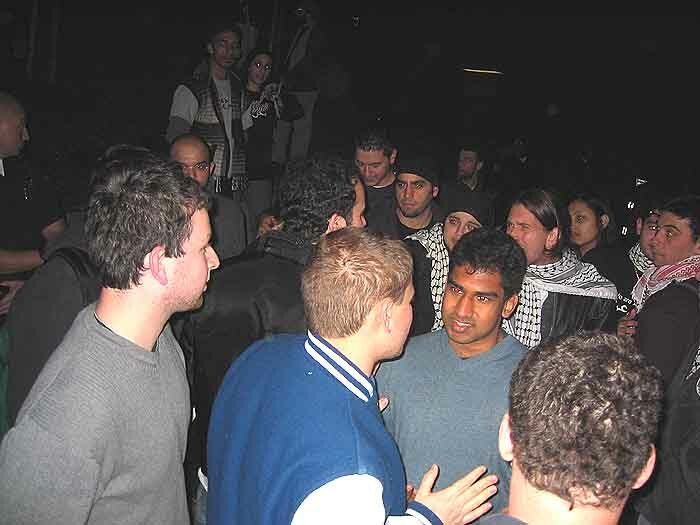 When the guy on the left confronted him, the guy with the Gandhi sign continued, "What's your address? What's your address? I'll come over one night and break in and we'll see if you try to kill me. It's the reasonable response if someone tries to steal from you. What's your address? Are you afraid? We'll see who kills who. Are you afraid?" This guy and his costumes and signs appear at nearly every rally in the Bay Area. It's not very clear from this picture, but behind the smiling student there was a phalanx of Palestinian supporters yelling at one of their opponents. 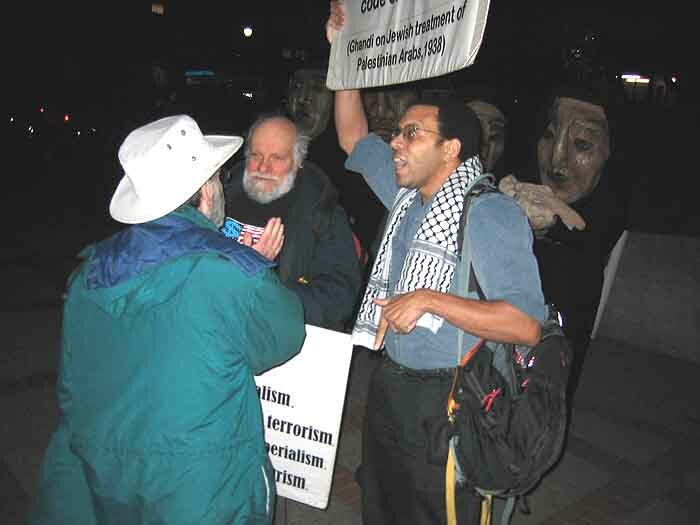 This picture shows one of the many times Daniel Pipes was interrupted by protestors inside the lecture hall. This group of protestors, as they left, were screaming "Racist Jew!" 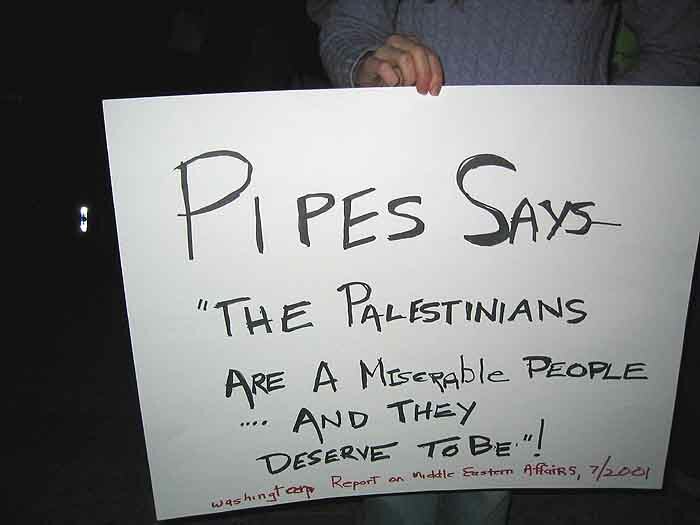 at Daniel Pipes and "Racist Jews!" at the remaining audience. One of the many signs at the protest. Another one of the many signs at the protest. 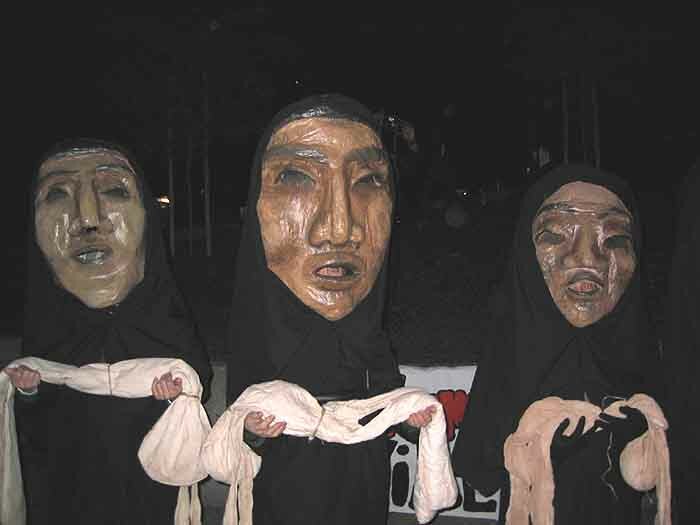 These papier-mache heads (a common sight at Bay Area rallies) apparently depict Palestinian mothers holding the corpses of their children. 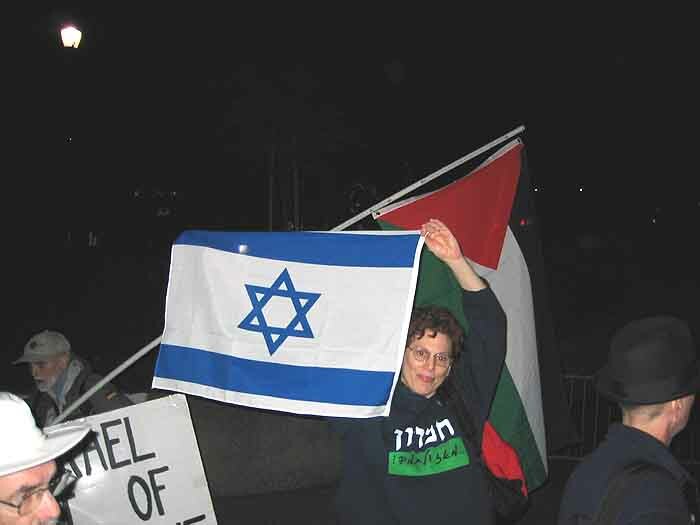 A Palestinian supporter and an Israel supporter engage in a flag duel. The violence-advocating and threat-laced diatribe described in the first picture continues. 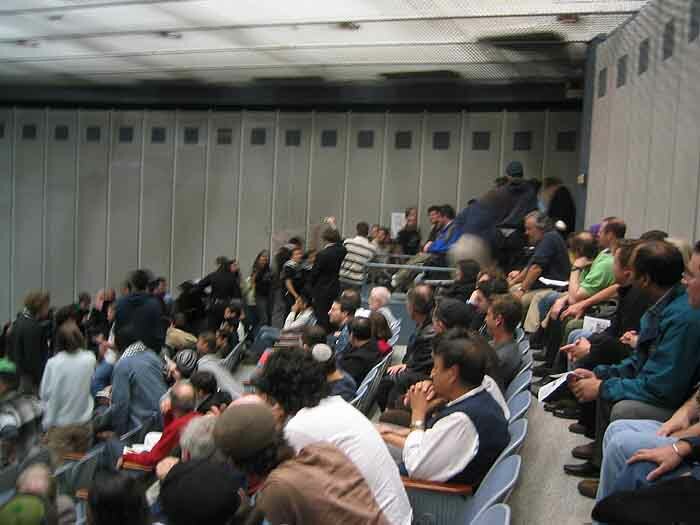 The two most extreme supporters for each side try to grab the spotlight as the audience files into the lecture hall. The Palestinian supporters on the left side of the picture are shouting "Racist!" and "Shame shame shame!" 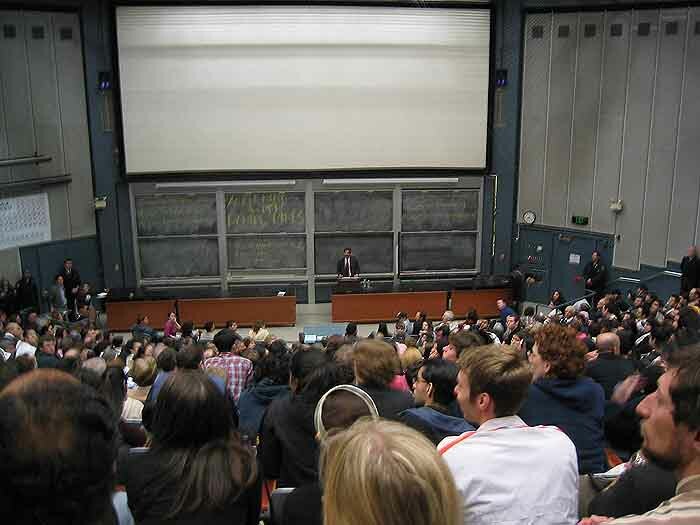 at everyone who is emerging from Pimentel Hall after the lecture; the entire audience was forced to run this "hate gauntlet," regardless of their political opinions, age or race. The guy in the center is an example of what many like to call "Palestinian chic" -- people who use Palestinian-style accessories as fashion statements or as an attempt to be "hip."